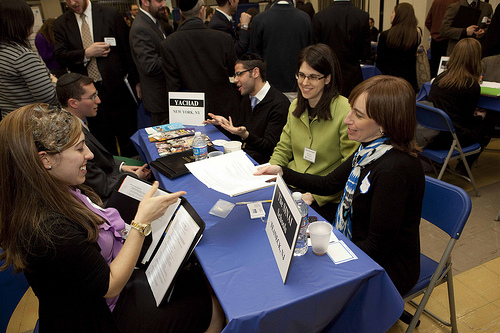 Yeshiva University’s Center for the Jewish Future (CJF) and Institute for University-School Partnership (YU School Partnership) will host their annual Jewish Job Fair on Thursday, February 28, 2013 in Furst Hall on YU’s Wilf Campus, 500 West 185th Street in New York City. The event is free and open to the public from 7 – 9 p.m., with priority admission for YU students and alumni beginning at 6 p.m. In addition to showcasing a variety of professional opportunities at well-respected Jewish schools, organizations and non-profits, the event provides a robust networking forum for job-hunters seeking information on everything from scholarships and internships to career development programming. Dozens of Jewish day schools and community organizations from across the North America will be in attendance to meet and conduct interviews with candidates. Participating organizations include the Orthodox Union, Repair the World, Nefesh B’ Nefesh, OHEL, Drisha Institute for Jewish Education, Manhattan Jewish Experience, AMIT Children, Aish NY, Organization for the Resolution of Agunot (ORA) and Yeshiva University. More than 40 day schools will be participating, including schools from New York, New Jersey, Pennsylvania, Connecticut, Florida, Missouri, Ohio, Texas, Tennessee, Virginia and Canada. For more information or to submit a resume, please visit www.yu.edu/jewishjobfair.